It is not that the planets "influence" directly any particular person by flashing a special kind of a ray which will make the person happy or cause him to break his leg. The cycles of the planets and their relationships represent to man reality in an ordered state and in reference to the "greater whole" which we know as the solar system. Men are "lesser wholes" within this "greater whole." Men can only find peace and lasting integration as they relate themselves in consciousness to the "greater whole," as they identify their own cycles of experience with cycles of activity of the "greater whole," as they refer their meetings with other men to the total picture which only a perception of the "greater whole" can reveal. Every man is a whole � an individual. But to be an individual is meaningless except in reference to human society � or at the limit, to the universe. A man living on a desert island without any possibility of his ever being related to another man is not an individual, but only a solitary organism without meaning in terms of humanity. An individual is an individualized expression of collective (or generic) human nature. What he receives from the collective which existed before him, he must return to the collective which follows after him. No individual exists in a vacuum. There is no organic entity which is not contained within a "greater whole" and which does not contain "lesser wholes." To be an individual is a social status. Every man is in latency a universal � or, as the Chinese said, a "Celestial." To bring out the latent into actuality, to transfigure the sphere of earthly man with the light, the rhythms and the integrated harmony which is of the "greater whole" and which the movements of celestial bodies conveniently picture � this is the goal for man. Astrology opens to us a book of universal pictures. Each picture is born of order and has meaning. Every astrological birth-chart is a signature of the cosmos � or of God. It is the image of the completed jig-saw puzzle. Man, by understanding such images can fulfill his experience, because he can thus see this experience objectively and structurally as an organic whole. He can see it as a whole, yet as integrated within the cyclic process of universal change which is revealed clearly in the stars and the planets, and confusedly in the nearness of his earthly contacts. Nothing is static, and no life is absolutely divided. Life is a process, and every process is cyclic � if we believe our experience, instead of imposing intellectual categories and ethical dualisms upon this experience. 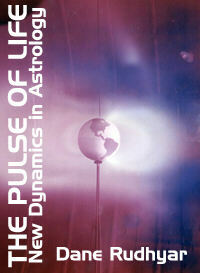 Astrology is a study of cyclic processes.